A helicopter with 5 people aboard crashed into the East River after taking off, killing 1 passenger and injuring 3 others. NYC mayor Michael Bloomberg says the pilot apparently reported problems in the chopper and said he was turning around. 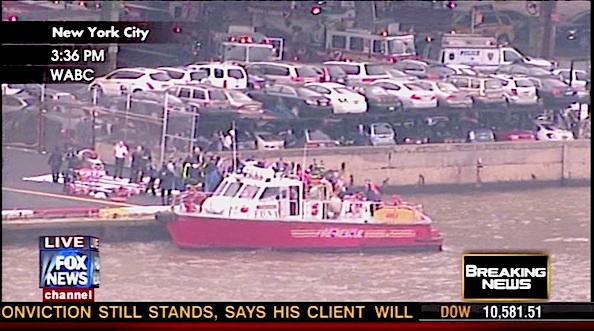 FDNY FIRE-RESCUE Boat near 34th Street and the East River (See video on FOXNEWS.COM). water temperature is about 68°F. the helicopter had four or five people on board. Fire department divers were reported to be possibly searching for a fifth victim. Fire-Rescue personnel were in the water immediately. The helicopter was submerged within seconds after hitting the water. 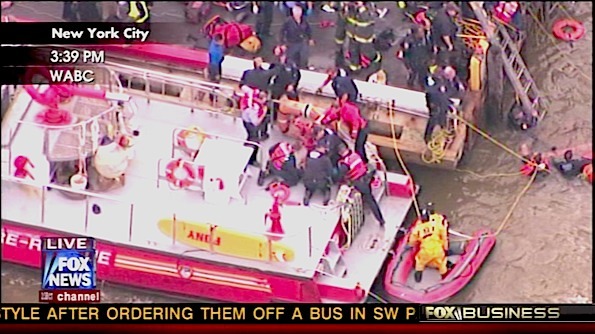 Fourth victim just transferred to a rescue gurney on a backboard from the water of the choppy East River (See video on FOXNEWS.COM). Two people are reported seriously injured. At least one victim rescued — possibly the fourth person that was rescued from the water — was being given CPR at about 3:41 ET Tuesday. One female is reported to be killed at the scene. A report from witness is that the helicopter was seen upside-down before it submerged completely underwater. Another witness said it appeared the helicopter appeared to be making a landing at the East 34th Street Heliport before it hit the water.